The waters off the Great Northern Peninsula are filled with delicacies from the sea. There is nothing better than accessing local seafood close to home. 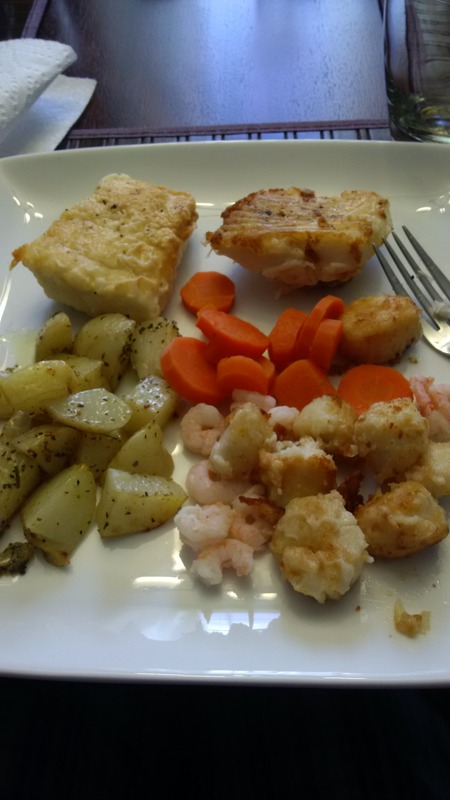 On the plate above is halibut, cod, scallop, shrimp complimented with roasted potatoe and sliced carrots. My father was a scallop fisher. This is a labour intensive process for the small 35 foot boat, dragging along the scallop beds and picking them from the buckets. Most of the time is spent shelling the scallop and taking only the white meat to sell to market. I am excited to see Northern Lights Seafood Ltd. of Main Brook engage in a new process that sells the scallop in a half shell form with all meat and additional product, which adds value. This is the type of secondary processing we need to see from our fishery that creates additional wealth down the value chain from end customer to harvester. It should be encouraged and supported. This concept will allow more sales of product from the fisher resulting in higher net income, plant workers receive additional hours for more labour intensive work, processor sells into higher value markets and consumers receive high-quality and demanded products from the pristine waters off the Strait of Belle Isle. The smaller processors have opportunities to look at secondary-processing in ways that creates niche products serving niche markets for higher yields. These types of technologies and adaptation must be encouraged if we are to remain competitive on a global level and satisfy changing trends of consumer demands. People want access to high-quality fish products and we have those products, we just have to gain access and package these products to cater to these consumer demands. We have to become more innovative when it comes to our fish products and encourage active infrastructure investments. Initiatives like “This Fish” (http://thisfish.info/) should be happening on the Great Northern Peninsula, where the fisher who caught the fish is part of the story. It works at the grocery store, restaurant, fish market at the local or global level. In May of this year, as the Official Opposition MHA responsible for Business, I joined Sam Slade our MHA responsible for Fisheries and Aquaculture to visit FFAW-UNIFOR’s launch of This Fish seafood traceability for halibut and lobster. There were several businesses and restaurants engaging in this process, showcasing their menus that enables traceability back to a local harvester. People want experiences, they want to know where their food comes from. This is an opportunity for our local fishers, local restaurateurs, retail and processing community to engage FFAW-UNIFOR to pursue This Fish initiatives on the Great Northern Peninsula. We have incredible fish products and fishers that need to be part of the story as exported fish from our waters ends up halfway around the world or on our neighbour’s dining table or at a downtown St. John’s restaurant. Let’s keep finding innovative ways to grow our fishery in Newfoundland & Labrador.